As someone who is rather partial to WWII tactical, I like the hex because it gives me fire arcs, establishes armour facings (front / flank / rear), it is easy to count out hexes for range and the uniform pattern allows us to say 'that is a woods' hex, whereas irregular shapes need to be formed by the shape of the wood and other geography and not just be an irregular shape for its own sake. But you know, perhaps the real reason why I like the hex is that it is just so familiar to me and there is a second nature relationship between my brain, eye and the hex, I can so easily read the battlefield in terms of hexes. Norm, I do agree. 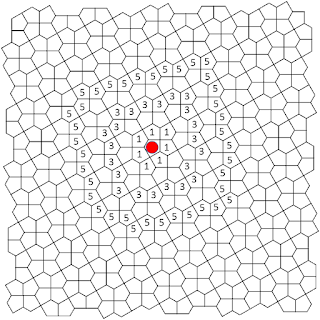 The hexgrid is so well-known that is often not questioned. 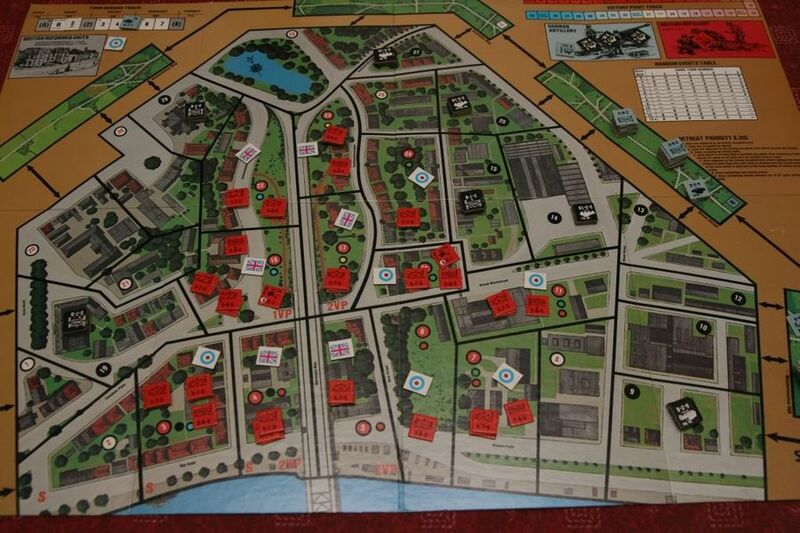 Actually, some people go as far as claiming that "if it doesn;t have hexes, it's not a proper (board) wargame". I don;t agree with such a dogmatic statement, because there are plenty of good games that use area-movement or point-to-point movement. Although irregular grids are probably not very feasible for miniature wargaming, it doesn't harm thinking about the concept. As in any good research, exploring even unfavourable alternatives might provide a better understanding of why current practices are the better solution. What dividing the board up into irregular areas does is to set up a specific topography. A game in point is Wizard's Quest, where the shape of the areas into which the Island of Marnon is divided creates a kind of 'grain' leading from NW to SE. Cutting across that 'grain' is the Great Tunnel' which is the only avenue of rapid movement from SW to NE. The game Shogun also has its topographical peculiarities. On the main Island of Honshu, is a rather long area which I regard as so strategically impostant, that if my main holding in in the area I make sure I seize it, settle and fortify it and plant as strong a static garrison as I can establish there. That allows me quick movement through the place; anyone else has to move around it and take more time. The field of triangles I like as being similar to hexagons if you play on the points, rather than the areas. 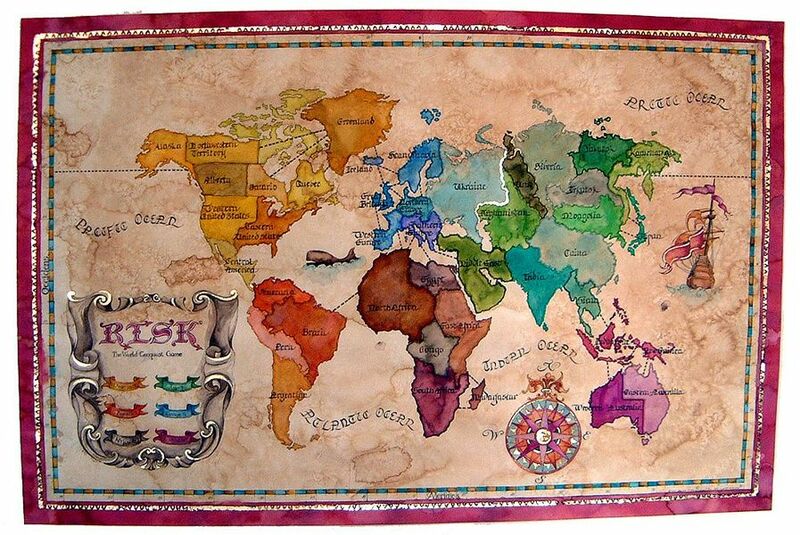 There may be aesthetical advantages to this over the hexes, at that, and possibly game mechanics as well. For instance, some terrain could be separated from the movement lines. I'm thinking of non-navigable waterways rivers and streams, hedgerows, and other linear obstacles. Roads and rail lie along the lines to speed up movement. 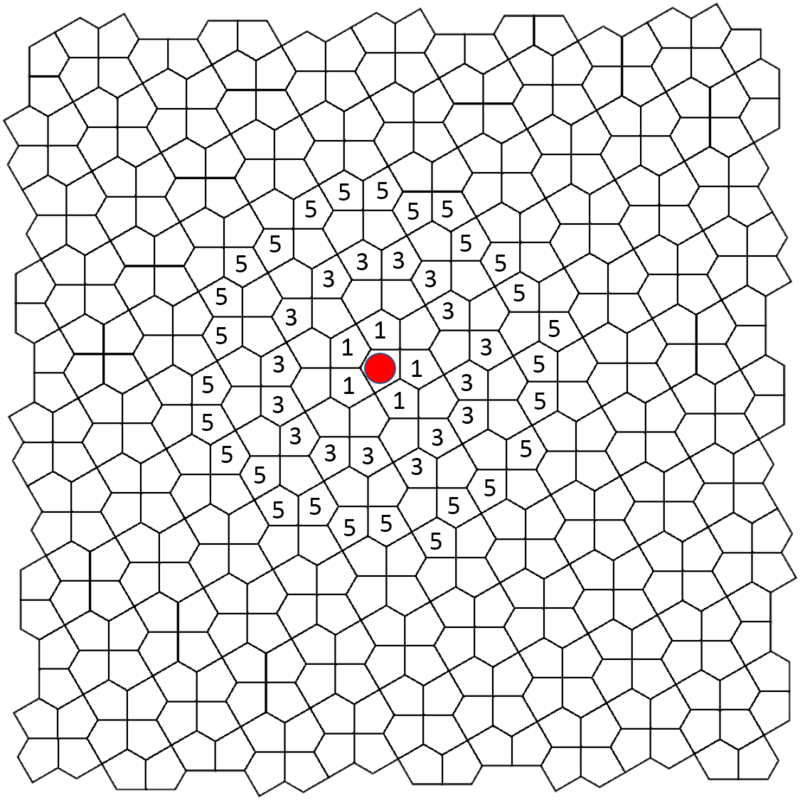 Movement along the points, though, would tend to indicate 'point' units, counters or single bases (which might carry several figures. The other shapes would, i think, take a fair bit of getting used to, especially determining range. Counting the ranges might not be so easy. 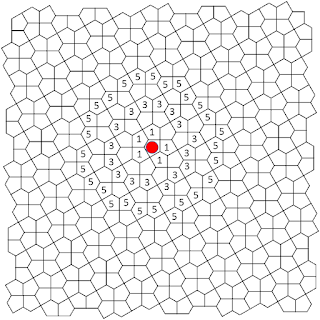 If you play on the points of a triangular grid, that is equivalent to playing on a hexagonal grid. I was thinking of using the triangular areas. Advantage is you have more axis to align troops along, but you get asymmetric connections (both edge-to-edge and corner-to-corner). Thank you for this post! A few month ago I also started to think about triangular grids and wanted to try moving some units around it, to see how it looks and feels. But then it slipped my mind. But your post reminded me of it. I am putting together my own thoughts on triangular grids. 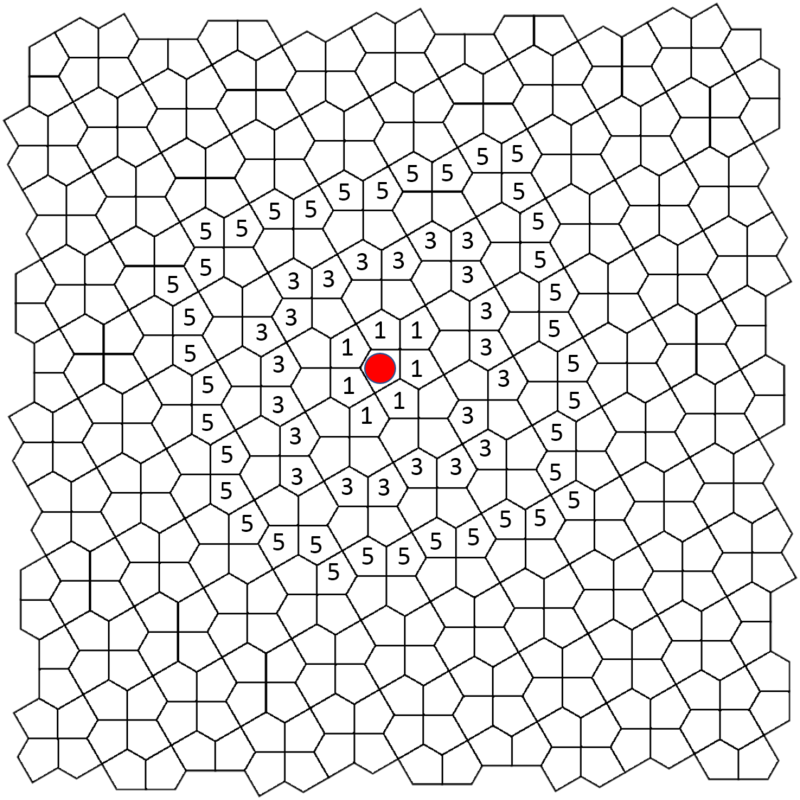 They do offer some advantages over rectangular and hexagon grids, but I'm afraid they will look and feel "too alien" to most wargamers.